Miss Sadie Grace Linton, 3-year-old daughter of Hailey Brown-Linton and Brandon Linton, was received into the arms of Jesus on Tuesday, April 9, 2019. 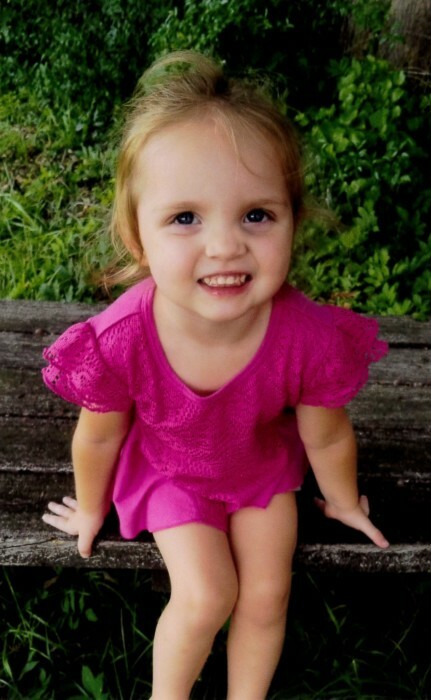 Funeral Services for Sadie Grace, and her mother Hailey, will be 4:00 PM Saturday, April 13, 2019 at Forest Pine Church by Pastor Danny Malloy, Andy Linton, and Brent Taylor. Following the service, they will be laid to rest together in the church cemetery. The family will greet friends from 3:00 – 4:00 PM Saturday, prior to the service at the church. Sadie was born September 24, 2015 in Hartsville, SC the baby girl of Brandon David Linton and Hailey Brown-Linton. She was a beautiful gift from God who was always smiling, showing love to everyone she met. An active little girl who loved Minnie Mouse, L.O.L. dolls and baby dolls, Sadie's favorite playtime activities included building with Legos and jumping on her trampoline. She also enjoyed building sand castles with mom and dad. She would often imagine herself being a princess in the castles she built. Sadie loved candy of any kind, especially bubblegum, and her favorite TV show was "Peppa Pig." She was preceded in death by her maternal great grandparents, Yates and Mary Barrett Brown; and paternal great grandfather, Wayne Lee. Survivors include her father, Brandon Linton of the home; big sister, Allison “Alli” Jordi Linton; paternal grandmother, Lynne Stephens of Patrick, SC; paternal grandfather, Joey “PaPa Juice” (Betty) Linton of Society Hill, SC; maternal grandmother, Sheila R. (Eddie Lang) Brown of Cheraw, SC; maternal grandfather, Dwayne “Snap” (Lisa) Lee of Wallace, SC; paternal great- grandmothers, Betty Lee of Wallace, SC and Lessie Linton of Cheraw, SC; aunts, Stacy Linton of Patrick, SC and Heather (Jason) Rivers of Wallace, SC, Abbi Lang, Grayson (Briar Gainey) Lang, and Jessica Riley; and their children, Bentson, Baylin, Susannah, and Jaden; uncles, Jonathan Y. (Carol Ann Riley) Brown and Garrett (Chasity) Lee both of Cheraw, SC; great aunt, Tammy (Billy) Quick of Wallace, SC; special cousins, Chris, Ryan and Holly. Memorials may be made to Founders Federal Credit Union on behalf of Allison Linton. Miller-Rivers-Caulder Funeral Home (www.mrcfuneralhome.com) of Chesterfield, SC is serving the Linton and Brown families.